Sometimes in my head I have too much to do, ideas bursting from here and there but I never got the time to actually bring them to fruition. Recipes for one are all listed down but remains there…sadly. So whenever I am alone to myself , which happens in the mornings – when I wake up or when the kids are all out, I’d get my me-time. That me-time is to contemplate on the day past, the plans for the day and of course what food to cook. I used to have a list of dishes that we enjoy – complete for the whole month and it did help me save time and money as I would buy ingredients per what is to be cooked. The 3oth and the 31st are always for special menus and what we all look forward to. Growing up with rice as a staple food and eating it almost everyday made me curious about quinoa since I first chanced upon it in a store near our place. That was years before—I never got the courage since to buy and actually try it until I had to pair it with the fish bought two weeks ago (related entry below). Knowing the health benefits of quinoa convinced me too…especially when I saw a recipe that includes sundried tomatoes. Another something wonderful I missed out on as a child. Totally makes me think, I come from a tropical country where fish is dried, mangoes, pineapples and other fruits are dried yet I’ve never had sundried tomatoes before…what was I eating? I got them from the store sealed in a vacuum-tight plastic container and not from a jar with oil. It’s easier to use! teehee! For this particular dish, just take about 5 and chop them up to smaller pieces and set aside. I should have listen to mom-in-law when she told hubby to watch dad-in-law debone the trout we caught last time we went fishing. (oooppss, still haven’t blogged about that.) He’s been doing it for years so he definitely knows how. This endeavor was not my first time to debone a fish but I haven’t really been successful with the previous ones too. I anyway tried my best to cut fillets, I set aside the bones with flesh still intact and made soup. So for the fillet, you sprinkle them with salt and a pinch of white pepper. Sear on olive oil for around 5-8 minutes turning once. For the quinoa, rinse a half a cup of them on cold running water to remove the bitter coverings (or whatever they’re called). Put them in a saucepan with boiling water and add some salt. Bring this to boil again and let simmer just as how rice is cooked, this should be about 8-10 minutes. Serve quinoa on a plate and top with trout fillet and chopped tomatoes. There, a healthy meal served and this is usually on the end of the month if I follow my dish list. I still have a bag of quioa in my pantry. I have been meaning to try it but just never got around to it. I like your idea of serving it with fish! I just might try that one of these days. Your photo looks delicious! Love the way you took the photos! 🙂 And that looks so yummy! Love your shots and I am also drooling for that fish. Makakapagluto nga nang isda ^_^ Happy weekend and regards to the family. ^_^ Thanks sa bisita. we don’t use sundried tomatoes in Pinoy dishes, that’s why. :p drying tomatoes is a way of preserving them, since we have tomatoes all-year long, we don’t need to preserve it. i have not heard of quinoa, i wonder if this is the same as chia. 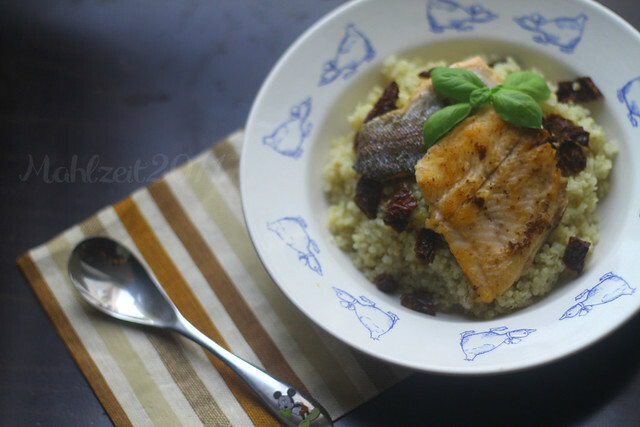 your seared trout looks good! 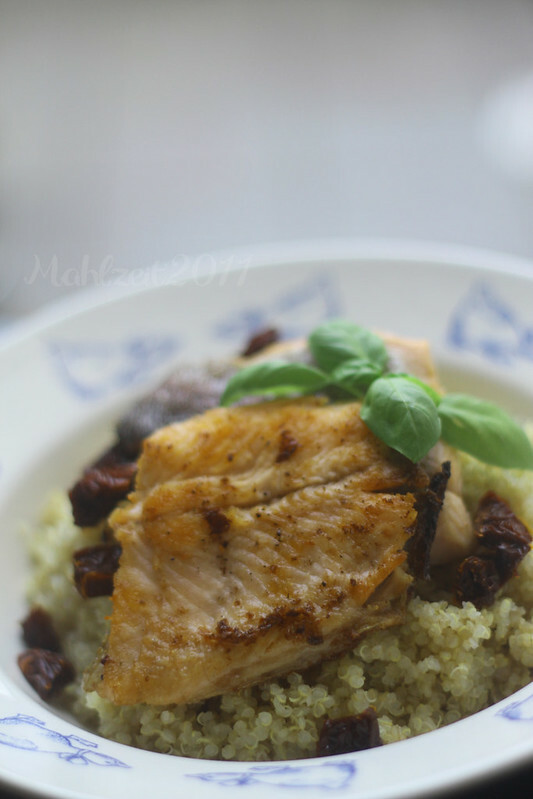 Fish and quinoa, a perfect combination. It’s healthy and delicious. I love it and your photos too. What does quinoa taste like? Parang rice lang din? i always wondered how sun dried tomatoes tastes like? always saw it sa mga foreign cooking shows. Sounds like a great dish! I have to admit, I have never of Quinoa — looks like an interesting food and would be perfect with trout. I haven’t had trout in years — love it!